Let’s discuss this topic in detail so you can know their features and workings in a much better way. A juice extractor is an appliance that can extract juice from both fruits and vegetables. It first cuts the item into small pieces and then rotates/spins the pieces at a high speed that separates the seeds and the skin. The final product that we get out of it is a pure juice of the fruit or the vegetable. A juice extractor, in simple words, is a device that handles the seeds and pulp in a way that the user only gets pure juice without any other thing in it. These are also known as fast juice extractors because of their centrifugal working mechanism. They are the most common ones and their biggest selling point is the fact that they are extremely fast. If you want to extract the juice without waiting too much then getting a centrifugal juicer would be a great choice. They work just like a washing machine by spinning the item at a high speed of about 12,000 RPM that separates the juice from pulp and seeds. The waste is collected in a separate container while the extracted pure juice is stored in a different container. With a juice extractor machine, you don’t even have to worry about cutting the fruits or vegetables into smaller pieces before pushing them into the feed chute. You can dump them whole and they will be forced down to the feed tube where they will meet a serrated blade that spins at a high RPM. Extracts the juice much faster because of the high Revolutions per Minute rate. You will have your glass of juice filled up before you even know. Easy to clean because they have less removable parts; the feeding tube, pulp tank, and the strainer. This is best for the people who need to make large batches of juice without waiting too long. It is ideal for people who want to preserve more nutrients in their juice and want it to remain fresh for a longer period of time. If you don’t have a problem with prepping work and have enough time to juice then a masticating juice extractor would be a perfect choice. 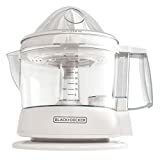 It is an affordable juicer that spins like a centrifugal juicer but much slower and is only primarily for citrus fruits. These juicers have a rotating cone-shaped head that is pressed against the half of the fruit in order to extract the juice. The pulp can be retained in the juice or separated depending upon your choice. They are also easier to operate and wash as they have only a few removable parts. There are a lot of variations and versions of electric citrus juicers that offer different features. Generally, you have a motor into the machine that helps the reamer to rotate and grate the fruit when it is pressed against the reamer with a force. The reamer is spun rapidly and can also spin in both directions for more efficient juicing. The juice might not taste that sweet because of the bitter oil that may get into the juice from the peel while juicing. Some citrus presses are also motorizes to make your work more convenient and efficient. They are just like the electric citrus juicers but have a lid on the top for pressing the citrus fruits. If you have less counter space then you must opt for a citrus juicer that is compact in size from both horizontal and vertical direction. Large commercial citrus juicer wouldn’t be the best option to go for if you don’t have sufficient space. 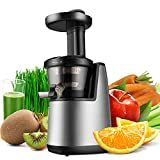 If you have a big family or want to juice in bigger portions, then it is recommended that you opt for a juicer that has a big enough container to fit the amount of juice you normally want to serve. Some containers also have measurement markings on them so you can easily keep track of the extracted juice. With this feature, you can control how pulpy you want your drink to be. If you like your juice to be completely pulp-free then you can do it by turning the regulator. Since washing the parts manually can be time-consuming and a hectic task especially if you don’t have enough time, so make sure the parts of the machine are dishwasher safe. Now that you have a solid understanding of your juicing options you can shop for the best product to meet your needs. Be sure to look at some of our items listed above to help get you started!